Happy new year. May it bring us all positive answers, a stronger sense of security, and some peace. The days between the years were great. I went home to blue skies and lots of sunshine for Christmas and flew back to Germany on the 31st. Long flights leave room for thinking (if one doesn’t get too distracted by the onboard entertainment, this time including the pilot), and this time of year invites reflection in general. So I will reflect on a year of PRs, months riddled by injuries, and a much lower mileage than I had planned for. First of all, if anything, I can appreciate my 10,000 lifetime recorded miles. Assuming I continue running, I can’t expect another 10,000 until 2023. But to run strong through 2023 is a good long-term goal! I’d love to not have any injuries until then, but to ensure that, I am going to need some assessments of my health that I hadn’t taken seriously enough, and age 25 is a pretty good time to start, especially if I want to continue to be a runner. I have a few doctor appointments planned. All things considered, I had a pretty good year running the majority of the time. Not meeting my 1500 (bumped up in June to 1700) miles goal is not bad news to me. I accept that I was challenged by injuries (one major one not running related) and should have been smarter. I reached 1367 miles this year, which is a nice prime number if you ask me. As long as I’m logging more than a mile a day for a year, I’m in pretty good shape. I guess not meeting a mileage goal (the first time I ever set one, actually) helped in the realization that I don’t have to take myself as seriously as a runner. I still have my lifetime goal of a sub-3hr marathon, but that’s not a priority, especially not now while I’m working on my doctorate. I don’t know if I’ll ever have time to focus on the training enough to dedicate mind and spirit, whole-heartedly, but for now I am grateful with consistency that will always leave a starting point better than square one, should I chose to reach that goal. Running is a part of my life and always has the potential to be more. Right now, that potential is enough, especially when I’m continuing to score age group (and super-occasionally overall) wins. My training from 2015 paid off into 2016 with a PR in the half-marathon in January and an 18 minute PR in the marathon February. I didn’t race again until Fall 2016, but did fairly well (considering 6 weeks off due to broken toe) in a 10.7km, 8.6km, and a 20km in December. I never recapped that race, but I was 7th overall for the females and ran a 1:33:40. Not amazing, off my goal by about 3 minutes, but still a good race considering the injuries, etc.. It also probably prepared me to end the year on a positive note with a 5K race on New Year’s Eve. In my race Saturday, I ran 21:32, placed 8th for the women, won my age-group and was off my 5k PR by only 18 seconds despite a hurting back, a freshly stubbed toe (race-morning wandering around the house in the dark, because I didn’t want to wake the whole household up) and not having trained specifically for a 5K nor training properly at all, due to a hurt tendon in the foot after the 20k. One can see how I took a few days off after I hurt my foot (coinciding well with a scholarship application due on the 15th), and slowly ramped up the mileage the following week. I learned again not to do too much too soon following a race, and the graph shows I had a better month than I allow myself in my memory. In general, the stats always seem better than the reality in my head. I need to get out of my head more often. One last running highlight of the year that I’d like to mention was volunteering at the Berlin marathon. I somehow missed signing up for the lottery for 2017, but may just volunteer again, anyway. Looking forwards, I intend to keep logging my running and keep updates with my blog posts. I also am running at least one marathon that I’d like to PR at on April 23rd. I haven’t decided yet if I will do another one (I signed up for one on April 15th, but am not sure about messing up my chance to PR on the 23rd), but for now the plan is to just slowly start upping the mileage anyway. I will also continue strength training, since I noticed a huge shift in the effort in the fall after the work I put into increasing my core and upper body strength. I plan to get to 50 miles a week by the middle of February and once I’m there, double-marathon specific training can still be decided. I can also use this time to address my nutrition without stressing about specific workouts, and in general focus on my academic life a little more. In February, it’s time to reassess and think about later in the year. But for now, I’m satisfied in my planning and excited about a lot of easy and long runs. Wishing you all a great year of running- and otherwise. First weeks and birthdays and PRs, oh my! The first week of the semester hit me hard. I finished teaching on Friday and felt like I’d been steam-rolled with a pair of my student’s textbooks, not to mention that I still had a class to go to. Let’s all agree that it’s a good thing there was race-day packet pickup. Still, the first week is over and now a routine will slowly settle and at least I didn’t have a hard training week, since I was tapering for the half. What that bodes for this upcoming week… we’ll see in a week. At any rate, I took it easy, and it shows in my training. Tuesday 1/12: 3.5 miles on my first day of teaching, got them in early while I still could, did a few miles on the bike trainer after bro’s birthday celebrations with the family. Wednesday 1/13: 5.7 miles early in the morning to get them out of the way before a long day at the uni, and then added a few miles in the evening when I got back for good measure. The morning miles were a fast set of intervals that I didn’t expect, and then the evening miles turned into a 7:30 tempo run. What what? Thursday 1/14: rest day? rest day it was. Friday 1/15: 2.3 miles to shake the legs out. Felt hard and slow, which is to be expected after a lower volume week. Had to talk myself out of admitting that this meant I would fail at my goals in Saturday’s race. Saturday 1/16: 1:37:25 Half-marathon PR. (beats my PR from last Dec. by 1:33) I almost did mess myself up at the race though, coming out the first mile at 7:02 and then thinking I could hold it for a sub-22 mile 5K for the first round. Should have been smarter (I guess I was delusional and thought I had the fitness for all 7 minute miles). I thankfully didn’t fall too far off the mark and held the 7:20-ish pace throughout. I don’t understand my splits, since there are too many 7:32, 7:27, 7:13 patterns, but I’ll get over that confusion. Ultimately, it was most important to me to practice my fueling strategies (I’m a stop and drink kind of person; no walk and sip for me) and gauge my fitness. I’m pretty happy with where I’m at, and I’m grateful for the PR even with the stupidity at the start! 7:02, 7:09. 7:21. 7:17.7:16, 7:32, 7:27, 7:13, 7:32, 7:27, 7:13, 7:32, 7:27, 7:49, 7:51, 7:32, last .1 at 6:05. Warm-up and cool-down (I forced myself to cool-down so that I avoid most of the pain from DOMS) brought the total to 16.5 miles. Sunday 1/17: pretty sore, though not as much as last year. Really wish I would have had some time for any sort of light movement, but had too much physics to do (funny, reading about things in motion while sitting around on my you-know-what). Monday 1/18: Worked out the soreness this morning with an easy 7.4 mile run. The beginning was hard, every down-hill hurt, but surprise-surprise, I loosened up by the end. Round this out with a nice walk with the family on the beach after breakfast, and the day was good before it even became noon. Happy MLK day, everyone. Hope you have a good week. That’s it. I’m signed up! We have received your online registration. The total amount will be debited from your bank account/credit card within the next few days. The transaction can be identified by the following reason for payment: Mika Timing HH0000493081. 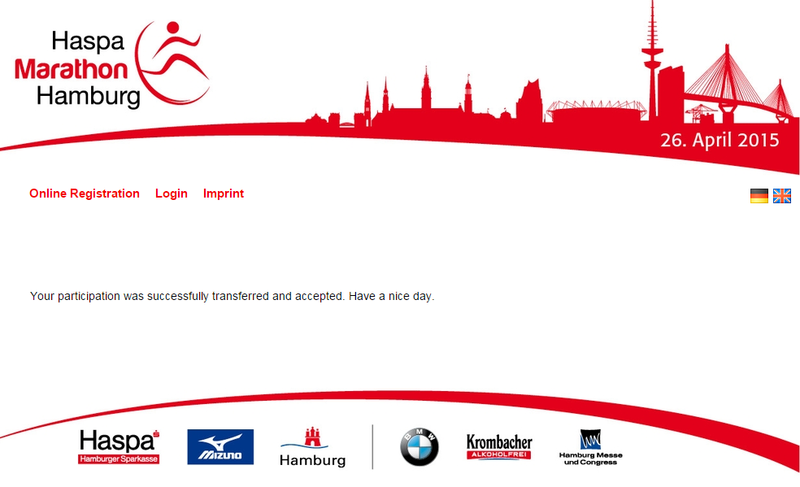 You will receive your official entry confirmation for the Haspa Marathon Hamburg 2015 via email around end of March 2015. You will only be able to receive your race pack by presenting your official entry confirmation (NOT THIS EMAIL) and your valid photo ID/passport at the accreditation. Today was the day before my race. Likely, I’ll forget about this day a few weeks from now because it will be overshadowed by tomorrow, which is race day. But for now, today is the important day. I did a few things to prepare and hopefully I’ll have a good run tomorrow so that next time I have a race, I can look back at what I did right. I started off the day slowly after a good night’s sleep of 7.5 hours. I probably could have slept longer, but I also was limited in what I can do. Since I am getting up at 4-ish tomorrow, I know that I won’t get more than 6 hours of sleep, but I can work with that. I ate my usual breakfast of berries and yogurt, but I didn’t eat oatmeal as I normally would have done. Rather, I opted to bake a banana-date-walnut bread and noshed on that instead. I baked the bread for several reasons. The most important reason was because I had a friend come in from out of town and I wanted something special to serve him that I could also eat myself, since I’m sugar-free. I also wanted a good carb-source to get some tasty carbs in for today (also hard to do when I’m sugar free), but also have something easy to prepare for a pre-race meal in the morning. I could make oatmeal tomorrow morning, but bread seems so much easier at 4 AM. I think if there’s anything I regret tomorrow, it will be putting dates in the bread, but who knows? Maybe I’ll appreciate the extra propulsion forward. The recipe I used can be found here. So, since my friend was over, I spent a good part of the day hanging around, off my feet. When I was on my feet, I certainly wasn’t doing anything strenuous. I made sure to drink my regular amount of water, which is about four liters. I think most of it was in tea today, but I’ll drink a bit more this evening before I head to bed. Finally, one of the things I did to prepare was a shake-up run. Back in the day, I thought that one was supposed to rest the day before a race. However, since I’ve been around the running forums and talked to more and more coaches, I’ve learned to make the second day before a race the day off, and do a light run the day before the race. That’s what I did. After corralling up my brother to join me, I put on my running shoes that I am not going to race in tomorrow (my Mizuno Wave Creations. I’ll race in my Sauconys that I feel slightly more comfortable in, even though neither shoe is really idea for racing) and went out. I set my TomTom GPS runner for 21 minutes because my goal for tomorrow is 21:something (preferably sub 30 sec) and I wanted to envision the run in my head. So when my brother wasn’t filling my head with his plans for the weekend, I thought about how I would feel at certain moments in the race. At minute 12 I was thinking “okay, you’ll be beyond halfway there here. Things will start to look tough and you’ll start to want to slow down, but you’re only halfway there. On the plus side, you’ve only 1.5 miles to go, which is easy-peasy!” Three-quarters of the way through I was thinking, “alright, you’re into your last mile. Things are going to go down now. You’re going to want to compromise, you’re going want to make arguments with yourself about why reaching your goal time isn’t possible. But it will be possible. You’re prepared. You’re well-rested. You will be able to do it if you’re willing to go through a bit of pain.” When my watch buzzes for the 90% done, I know that I’ll have about two minutes left to give it all I’ve got. At that point, I know I’ll want to push myself. To round-out this live-race vision, I did some pick-me-ups to just feel some speed. The first one felt awkward, as it should after an easy 9:30+ mpm run, but the next few felt good. I didn’t push myself too hard, but made sure to extend my legs and get a real stride going. Now that I’ve done everything physically that I need to do for preparation, it’s all mental. I’ve got my socks chosen, I know what shoes, shirt and shorts I’m going to wear. I’ll bring my wallet for gas in the morning and my ID for packet pick-up. I am thinking of bringing a towel and a change of clothes, as well as filling up all my water-bottles to have in the car. I’m eating some sushi tonight (something I do every Friday and have done several times before races), playing cards and watching some tele with the family, and going to be around 2215. The only thing I haven’t really decided is whether to run with music. Most of my interval and tempo runs have been with music, so I’m afraid I’ve come to rely on it. On the other hand, I don’t want to be anti-social at the race or during the run. I want to be among fellow runners running for the good cause that is memorializing the heroes of 9/11 and funding ceremonies in the future. I believe in the cause this run is hosted for, because I believe it’s important not to forget what happened 13 years ago. I’m afraid to dishonor the memory of those this run is held for, because I won’t be participating actively with the participants and the volunteers while I run. I guess I can just try to do my best before and after the race. Race time is 6:30. It’s going to be about 84 degrees Fahrenheit with 90% humidity (ew). I’m going to be up at 4, out of the house by 5:30, and warming-up by 6.